A review of the Selective Health Insurance Company finds the Selective Insurance Group, based in New Jersey. The Selective Insurance Group is comprised of seven separate property and casualty insurance providers. Health insurance quotes are just a moment away! Simply type your zip code into the free toolbox above and you’ll be looking through rates in no time. The Selective Insurance Group was founded in 1926 by Mr. Daniel L.B. Smith in Branchville, New Jersey. Now 85 years later, the company sells policies in 22 states, mostly in the eastern and midwestern parts of the country. The Selective Insurance Group offers both personal and business coverage, but it does not sell health insurance. The company has many locations throughout the 22 states it serves. To find the correct office for your inquiry, click on the “Customer Support” tab on its website, and then the “Office Locations & Phone Numbers” drop-down menu. If you have a billing question, you can call toll-free at 1-800-777-9656. Alternatively, you may report a claim, any time of day or night, by dialing toll-free 1-866-455-9969. Pay their bill on time, each time. Additionally, student drivers on their policy can help get discounts with good grades and/or finishing and passing an approved driver’s ed class. The Selective Insurance Group uses independent agents, located throughout its coverage area. Independent agents are sometimes better for policyholders, since they are able to shop around the insurance providers that they represent to get you the best price for the policy that fits your needs. Instead of having to sell you a standard policy from the company that employs them, an independent agent is able to more specifically tailor a plan by perhaps combining an auto policy from one company, a health insurance policy from another company, and a home insurance policy from a third company. The Selective Insurance Group uses Trusted Choice® independent agents. Trusted Choice® has partnered with approximately 60 insurance companies to sell their policies, including health insurance providers. Because of this, you can still purchase health insurance in a combined plan with other policies that Selective offers, even though the company itself doesn’t sell health insurance. To find a Selective Insurance independent agent in your area, click on the “Find an Agent” tab located on its “Customer Support” page. Once there, you can search by agent location or agency name. Trusted Choice® also has a “Find an Agent” tool, search-able by zip code. 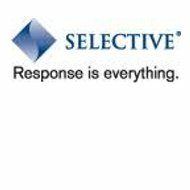 The Selective Insurance Group is always looking for qualified and motivated people to join the company, and it offers extensive information about careers with the company on its website. If you are interested, you can search the company’s job openings online, by keyword, location, or category, or just look through everything available at once. Not all opportunities are in the insurance industry. Current openings range from underwriting technical assistant to senior application developer, and claims supervisor to paralegal. You can also submit your resume to the company for general consideration. Find health insurance rates from providers in your area just by putting your zip code in the box below!